Untitled [large family group] by Mike Disfarmer. Over time art museums tend to systematize and homogenize their holdings, but most of our public art collections began with the idiosyncrasies of individual collectors. 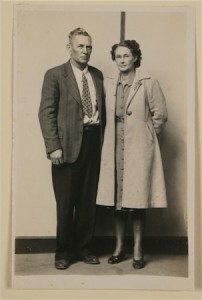 This is why, for instance, the Utah Museum of Fine Arts (UMFA) has a surprisingly strong collection of Egyptian artifacts – Natacha Rambova, a wealthy heiress, onetime wife of Rudolph Valentino, and great-granddaughter of a Mormon apostle, donated part of her collection to her native state of Utah (see here). 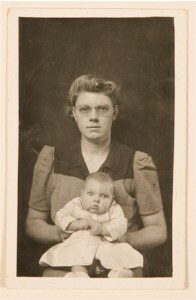 Or why it is currently mounting an exhibition of small, timeworn images by a photographer from Arkansas. The UMFA has a very well-respected photography collection, due in large part to collectors James & Debra Pearle, and the close circle of friends that have joined them in donating works to the museum. Among these are Daniel and Melanie Mattis, whose son, Michael Mattis, began been amassing a large collection of original photographs by “penny portrait” photographer Michael Disfarmer in 2004. As UMFA curator Donna Poulton tells it, Mike Disfarmer was the town recluse of Heber Springs Arkansas, the odd type of character that everyone in town liked to talk about but whom few knew; the eccentric curmudgeon who bucked social norms and instilled fear in the hearts of youngsters. Oddly enough, he was also the local photographer. Out of a simple live-work space he built himself, he took photographers of just about everyone in the area, from the well-to-do mother showing off her children, to the dirt farmer in his best overalls. When Disfarmer died in 1958, he was unknown outside the small Ozark town. 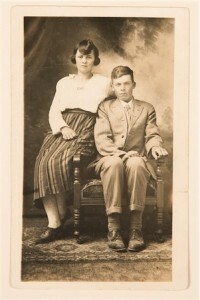 His anonymity changed in the 1970s when Disfarmer’s original glass negatives were discovered, cleaned, and published in a book – Disfarmer: The Heber Springs Portraits, 1939–1946. These portraits of the full range of characters from rural America, taken in unadorned settings and frequently capturing unguarded moments, caught the attention of an art world in the full flush of minimalism and Disfarmer became a posthumous art star. His star blazed even brighter after 2004, when original prints by the photographer were discovered and purchased by Michael Mattis. 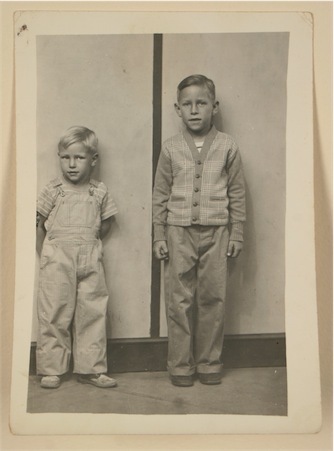 Today, Disfarmer’s portraits of young children, departing soldiers, and awkwardly arranged families are increasingly sought after; and thanks to the donations of the Pearles and Mattises, as well as Dr. Donald L. and Alice A. Lappé, scores of them are now on exhibit at the UMFA in the museum’s newest exhibit Mike Disfarmer: Cleburne County Portraits. Middle aged couple, man wearing pin-striped suit, woman in coat Gelatin silver process, paper Dimensions: image: h: 4 9/16 in x w: 3 1/16 in Credit: Purchased with funds from Dr. Donald L. and Alice A. Lappé, Michael P. Mattis and Judith G. Hochberg, and Dr. James E. and Debra Pearl. 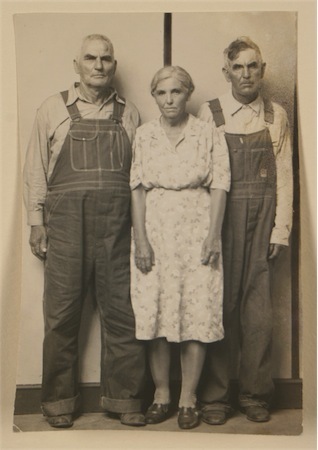 Over the more than three decades, Disfarmer took portraits of the residents of Cleburne County, Arkansas, he never upgraded his technology, continuing to shoot with glass negatives long after the mainstream had given them up for more advanced and lightweight setups. As we see in the photographs, however, his studio was transformed over the years. Early photographs from the ’20s show traditional backdrops of romantic landscapes. Over time, these give way to plain monochrome backdrops, and in his final years Disfarmer placed his subjects in a room almost completely white save for a simple black table and a mysterious dark line that extends from floor to ceiling. The locals that came into his studio in these years ended up looking like Grant Wood’s farmer stuck in a Mondrian. 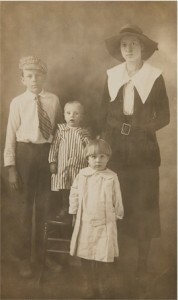 In Disfarmer’s compositions the vertical stripe frequently breaks one of the most basic rules of portrait photography, splicing the subjects in half. Its purpose – was it used for placement? “Stand in front of this line and don’t move.” Did it join two sheets of wall surfaces? – will likely remain a mystery. And Disfarmer might have liked it that way. He remained a mystery to the people he lived with for more than 50 years. His patrons were likely as drawn by the thrill of seeing the odd recluse as by any desire for a keepsake image. 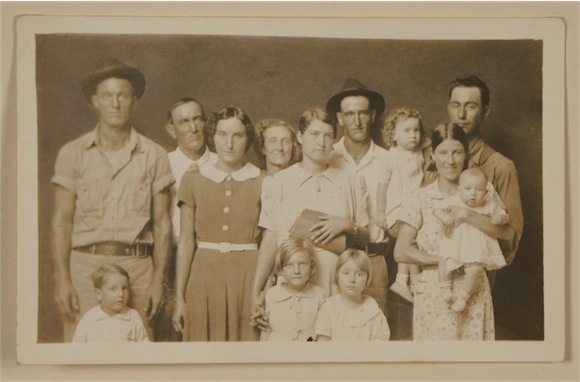 He turned his back on his roots, claiming at one time to have been torn from his real family by a tornado and placed with the Meyers – a rural Arkansas family whose surname means “dairy farmer” in German. His choice of a replacement name – Dis-farmer – is as antagonistic as it is unmelodious. Disfarmer’s eccentric behavior extended to the studio. His lighting adjustments were said to take up to an hour. When he was ready to shoot, he would place his subjects in a room, give them detailed instructions about what to do and not do, then disappear behind a wall, where he waited until he thought the moment was right to take the shot. Frequently tired and not knowing exactly what was happening behind the wall, Disfarmer’s subjects were caught in unguarded moments. His sitters smile infrequently. More often they are caught in a moment of pause, not really sure when the photo will actually happen (there was no “say cheese” clue). Sometimes, as in the case of a portrait capturing two small children, they are visibly scared. The resulting portraits are frequently awkward and oddly intimate. They are unlike the famous photographs of the Depression era, ones by artists like Dorothea Lange, seen through the filter of politics and surrounded by the aura of History. They are the manifestation of an idiosyncratic gaze, of a man who cannot stop looking at the world from which he feels himself removed. Mike Disfarmer: Cleburne County Portraits is at the Utah Museum of Fine Arts through July 14th. Tonight, Wednesday January 30, curator Donna Poulton will be discussing Disfarmer at a free lecture, which will also feature a screening of the documentary Disfarmer: A Portrait of America. The event begins at 7 pm and is free and open to the public.